Help your website stand out in Google Search. Use TrustBox widgets to get rich snippets with your TrustScore and your total number of reviews. A TrustBox won't directly improve your website's SEO, but the structured data makes it easier for Google to understand your rating. This can increase your organic click-through rate, drive more traffic to your website, and improve your rank over time. For more information about structured data, Google's written some guidelines that you might find helpful. If you're interested in getting Rich Snippets for product reviews, check out our SEO-friendly Product Reviews TrustBox. TrustBoxes are the fastest and easiest way to showcase reviews on your site. We’re continuously following trends in structured data and to ensure that your implementation complies with Google’s guidelines (provided you carefully follow the TrustBox implementation guidelines). In Trustpilot Business > Integrations > TrustBox Library, select TrustBoxes Optimized for SEO from the drop-down menu, then choose your TrustBox. Enable the Enable Rich Snippets for SEO setting. Implement the TrustBox code on your website. Make sure you follow the implementation guidelines. Optional: If you want the rich snippet to feature sameAs links to your social media profiles, provide this data in your Company Profile. Log in to your Google Search Console and select your website. 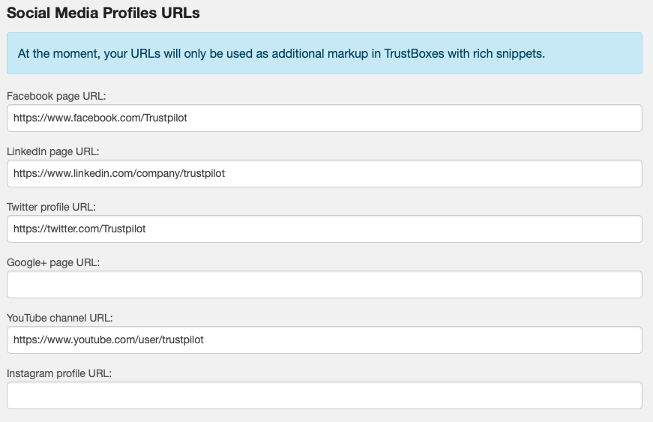 In the Inspect any URL in your site's name field, enter the URL of the page that contains the TrustBox. Once the URL data has been retrieved, click on Request Indexing. If you get a message that says "URL is not on Google", try pushing the Test Live URL button to find out why Google cannot crawl your page. Repeat this process for all the URLs that contain the same TrustBox. Once Google has indexed your pages, your rich snippets should begin to appear in Google Search. If you have a low-authority site – one that Google doesn’t crawl very often – it can take up to three months before Google crawls your pages. You need to prompt Google to fetch your new content. We've got some tips on how you can optimize the process and improve the likelihood that your rich snippets appear in search results. Position the TrustBox above the fold, or in a clear and visible position on your page. This makes sure that people can easily see your Trustpilot stars right after they land on your page. Tip: To prevent the TrustBox from appearing across your entire website, avoid placing it in the global header, footer, or navigation menu. Don't display rich snippet stars from your TrustScore across all pages on your website. Google considers this to be spam, so it's not a good idea. Instead, consider placing a regular TrustBox (without rich snippets markup) on other pages. 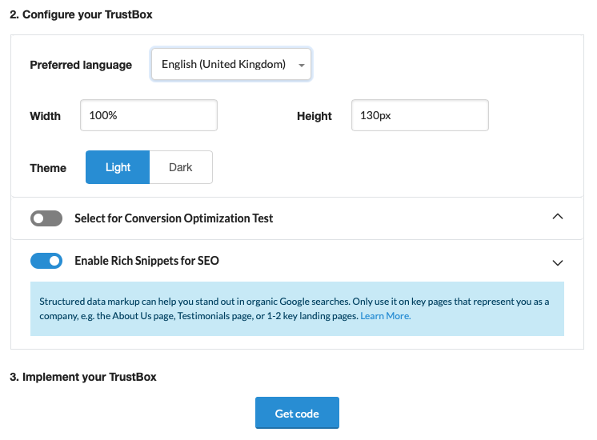 Don't add the SEO TrustBox to your category pages. Google's guidelines state that category pages cannot have rich snippets, so if you do this, you'll be breaking their guidelines. Although Google doesn't support rich snippet stars on homepages, we still recommend that you add an SEO-optimized TrustBox there to enrich your website with good metadata. This improves your website's overall visibility in Google’s Knowledge Graph. Important: Whether rich snippets are displayed or not depends on Google. Even if you have satisfied all of their guidelines, it is still Google's decision whether they display rich snippets in SERPs.